With St. Patrick’s Day right around the corner, I prepared a couple of cabbage dishes. 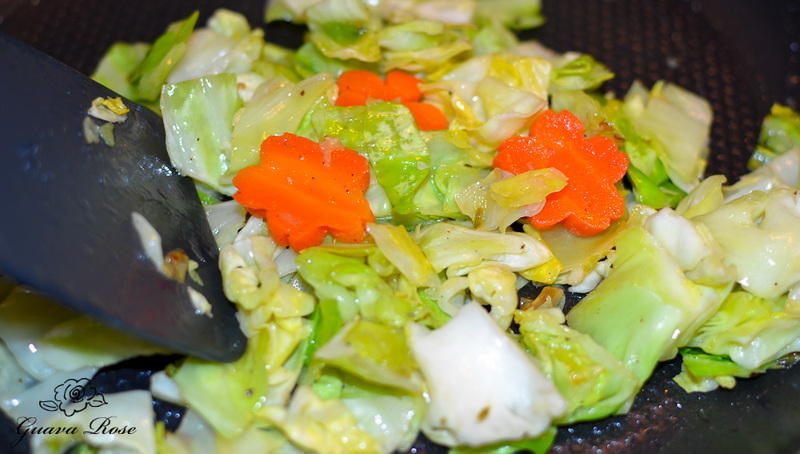 Here I’ve used a regular green cabbage, and some sliced carrots. I steamed the carrots first, since the pieces of cabbage would cook so much faster than the raw carrots would. I think it makes for a nice change from the usual boiled cabbage and carrots. Heat a little oil and butter in a non-stick frying pan. Add some fennel seeds if you like, then the cabbage. Stir fry until the cabbage a almost done, then toss in the carrots. Season with a little salt and pepper. That’s it. All we need now is the corned beef! I made the baby bok choy pictured above as a test recipe for Steamy Kitchen. Isn’t it beautiful? I seem to love admiring pretty vegetables and fruits– well, any kind of food for that matter, and flowers too! It looks exactly like how I prepare my baby bok choy, except we use different flavorings. My family enjoys it steamed tender, then drizzled with oyster sauce and a little sesame oil. I’ve found that the less you cook the cabbage, the stronger the mustard undertones and bite. 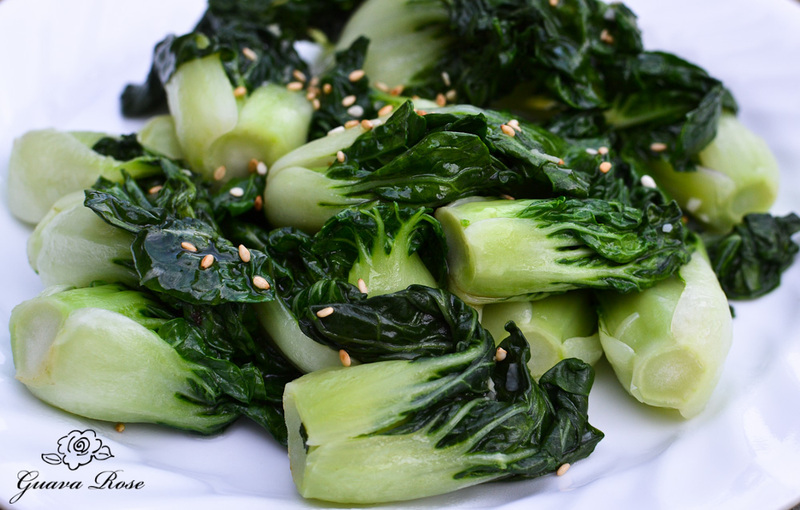 I like boy choy both crisp and tender, but the kids seem to like it better on the tender side. Hope you have a Happy and Lucky St. Patrick’s Day! 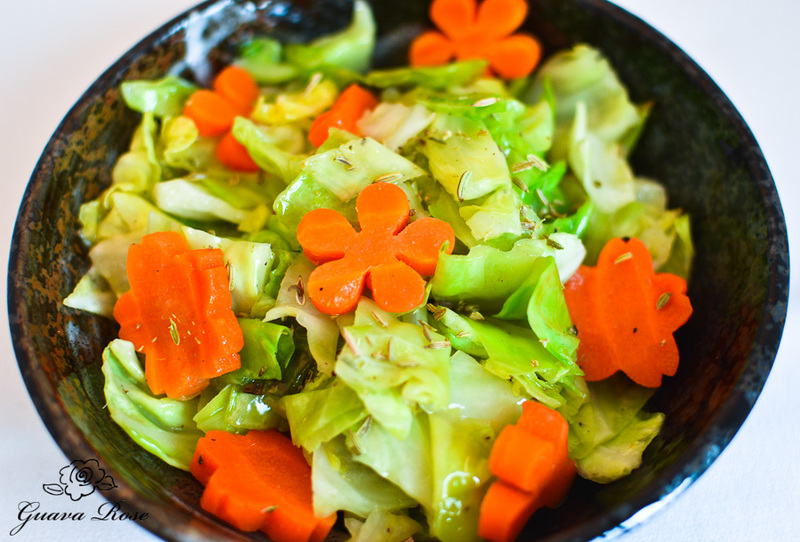 A simple stir-fry of cabbage and carrots. Heat oil and butter in a large non-stick frying pan on medium high heat. Add fennel seeds, then cabbage. Stir fry about 5 minutes, or until cabbage is almost done. Toss in carrots and heat through. Season with a little sea salt and pepper.